Our 4 beautiful, pet-friendly homes are perfectly suited for you and your dog so you can enjoy your stay in Wynnum Manly, Brisbane! Choose from any of our dog-friendly accommodations to experience a purr-fect holiday! Or was that a woofing good time? 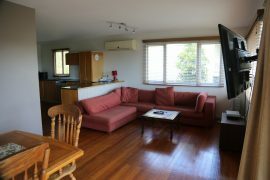 At Wynnum Manly Hideaway, we understand your need to enjoy the holidays with your whole family, your pets included. After all, why leave the happiest member of your family at an over-crowded kennel or with a stranger when you can bring them with you? 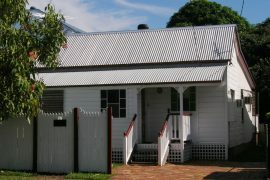 All houses are fully fenced, allowing your pet to roam free in the privacy of your back yard. This is critical for your dog’s safety as well as your peace of mind. Carpets have been removed where possible and are only found in some bedrooms. Therefore no more nasty stains, and no chance of hair left behind by previous tenants. Plenty of shade & shelter is another feature, so your canine or feline companion can relax, protected from Brisbane’s beautiful, yet occasionally extreme weather conditions. A back yard doggy door is included in some houses, so your pet won’t feel lonely and can come and go as they please should you choose to let them. Over the 10 years that we have been accommodating families and groups in Brisbane, we’ve seen a significant rise in the number of holiday-makers asking us to assist with their pets. With such a high demand for the combination of pet-friendly and family-friendly lodgings, we’ve decided to make a number of deliberate changes to each of our houses so that you and your pet can fully enjoy your stay. Step foot into any of our pet-friendly accommodations and you will see that we’ve made every effort to ensure that the furry members of your family will also feel right at home. All our 4 fully-fenced properties offer plenty of shady areas, perfect for your pet’s relaxing afternoon nap. Some of our houses come with backyard doggy doors for their easier access in and out of the house. These are just two features we have incorporated in our homes to create less stress and more fun for you and your four-legged friend! Welcome to a dog-loving community! Wynnum and Manly are dog-friendly suburbs with many facilities that ensure your enjoyable stay with your four-legged friend. Your dog is allowed in most public places as long as he has a lead and controlled effectively (except at an off-lead park). We are part of the Moreton Bay Marine Park. As long as your dog is on a lead, he is free to explore and go anywhere within this area. Your dog is also welcome to enjoy the water and beaches, so if you wish to cool down, simply have your dog on a lead and swim! Be sure to check out our list of 16 Dog-Friendly Beaches in Brisbane & Beyond. The Brisbane City Council has kindly provided four dog off-lead parks in the Wynnum Manly area – see 10 Dog-Friendly Parks in Wynnum Manly. These popular parks will give your dog a chance to practice his social skills with his fellow loyal kind. Some of these parks have facilities like wooden trunks where he can show off his motor skills as well! 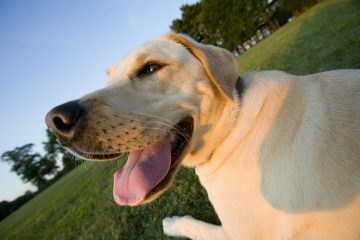 There are also plenty of dog-friendly parks in Brisbane that will give your best buddy the time of his life, either with his newfound friends or with you! Grab the lead and start walking! Strolling with your dog along our 5km of beachfront esplanade will give you panoramic views of Moreton Bay, as well as an opportunity to meet and chat with locals about your favourite travelling companion. See our Dog-Friendly Walks in Wynnum Manly and Brisbane Pet-Friendly Walks. For your convenience, the well-kept footpaths have doggy-do-do bins with plastic bags free of charge along the way. Doggy drinks fountains will keep your furry friend hydrated throughout your walk. Outside the Harbour Village shopping centre at Manly is a purpose-built dog leash holder with water bowl. This is conveniently placed outside IGA on Cambridge Parade. The water bowl for dogs is always kept fresh and full. There are numerous cafes & bars in the area that cater to dogs and their owners including these 7 Pet-friendly Cafes & Bars in Wynnum Manly and 10 Dog-friendly Cafes & Bars in Brisbane. Drinking bowls, and even special treats at some places, are provided for your dog’s hearty satisfaction. Some also feature a dog-inspired décor to help you and your furry friend feel right at home. These is a popular places among dog owners are easy to walk or drive to, depending on which house you are staying. Most have an extensive menu ranging from takeaway to a la carte dining. Your dog can sit quietly by the table while enjoying the interesting sights and sounds of this bustling suburb, while you dine in the company of your loyal pet. If you feel like pampering your pooch with a holiday treat, or simply want to maintain his impeccable hygiene, simply head to the pet groomers and mobile dog hydro baths in Wynnum Manly to keep your dog looking polished and stylish as you during your holiday! And in the event of a medical pet emergency, you need not worry about where you can get your pet treated. Choose from half a dozen vet clinics in Wynnum and Manly and let the professional vets give the proper medical attention to your beloved pet. Some clinics even offer 24-hour vet care so you can rush your pet any time if needed. 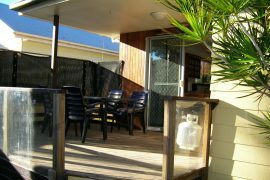 Here at Wynnum Manly Hideaway, we offer pet-friendly holiday homes in response to our customers’ needs and the demand of our industry. We understand dog and cat ownership in Australia at its peak, and that’s why we strive to assist pet owners like you who choose to travel with your furry friend. While we have a few pet rules just like you would at home (see our terms and conditions here), we guarantee that all our 4 houses have been set up for your pet’s comfort. 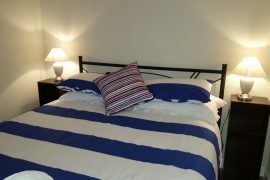 Where else can you find a comfortable accommodation located near off-lead parks, pet-friendly cafes, vet clinics and other pet-friendly facilities?